The Digital Research Library of Illinois History Journal™: Josephine Garis Cochrane [Cochran] (1839-1913). Inventor of the Dishwasher. Josephine Garis Cochrane [Cochran] (1839-1913). Inventor of the Dishwasher. Josephine Cochrane believed that if you want something done right you better do it yourself. 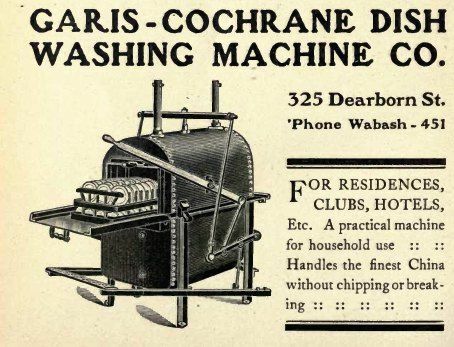 But when it came time to doing the dishes, she really didn’t want to, so she invented a machine to wash them for her. An attempt had been made before her, by a man, but it didn't work and never got off the ground. 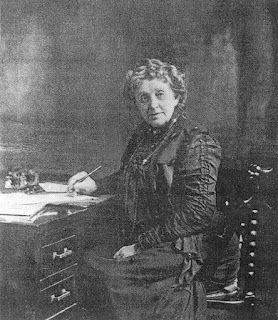 Josephine Garis was born on March 8, 1839. Her early childhood is unknown. After her mother, Irene Fitch, died and her sister moved out, she lived with her father, John Garis, in Ohio and Indiana. John Garis, was an engineer from Chicago who had invented a hydraulic pump for draining marshes. He worked as a supervisor in mills and as a hydraulic engineer, perhaps instilling in Cochrane an instinctive knack for the mechanical. She attended a private high school, but when it burned down, Garis sent his daughter off to live with her sister in Shelbyville, Illinois. The Cochranes had a busy social life, and in 1870 when they moved into what could be considered a mansion, they had the perfect house for entertaining. They threw dinner parties using heirloom china allegedly dating from the 1600s. After one event, the servants that washed up carelessly chipped some of the dishes. Cochrane discovered this the next morning while she was putting the dishes away. She was furious and refused to let the servants handled the china any more. She may have regretted her decision, but she didn’t give in. The morning after every subsequent dinner party she begrudgingly endured dishpan hands wondering why someone hadn’t invented a machine that could clean dirty dishes. This was, after all, the late 19th century, and if someone could invent a machine to sew clothes and cut grass, then how hard could it be? Her creation had wire compartments for plates, cups and saucers. They were put inside a wheel that lay flat inside a copper boiler. A motor turned the wheel pumping hot soapy water from the bottom of the boiler over the dishes. Cochrane showed her design to a few men for their input which ended up being a frustrating experience. “I couldn’t get men to do the things I wanted in my way until they had tried and failed in their own,” she said. “And that was costly for me. They knew I knew nothing, academically, about mechanics, and they insisted on having their own way with my invention until they convinced themselves my way was the better, no matter how I had arrived at it.” Finally she got help with the construction from mechanic George Butters. She applied for a US patent, which she received on December 28, 1886, obtaining U.S. Patent # 355139, the Garis-Cochran Dish-Washing Machine. An earlier, unsuccessful dishwashing machine had been patented, in 1850, by a Joel Houghton. It was made of wood, and hand-cranked, and just ineffectually splashed water on the dishes. Consequently, the introduction to her patent application reads that her machine is an improvement. A drawing of Joel Houghton's 1850 patented dishwashing machine. 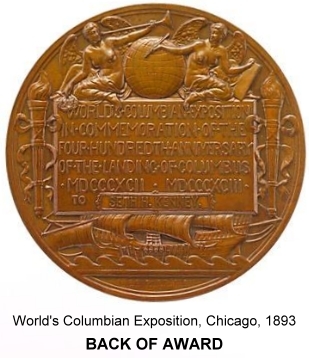 Josephine displayed and demonstrated the machine herself at the World's Columbian Exposition in Chicago in 1893, where it was exhibited in the Machinery Hall. 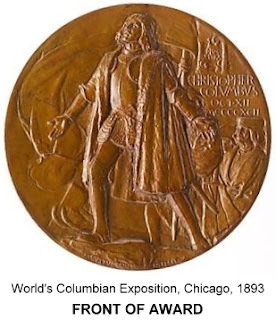 The dishwasher was a hit and won the Augustus Saint-Gaudens Medallion, the same award for all contest winners who were in the top 20% of their category in scoring. 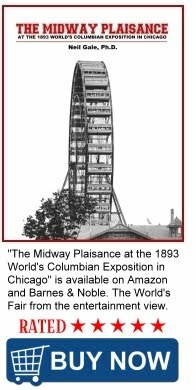 She also sold nine of them on the spot to people who were running kitchens at the Exposition to the tune of $150 each (today, $4,064). Her next model was motorized; it pumped the water itself, and moved the rack back and forth. She registered this one for an American patent in 1900. A subsequent model had the racks revolve, and drained itself via a hose into the sink. That success led to her opening her own factory in an abandoned schoolhouse. Her customers extended to hospitals and colleges for whom the sanitizing effects of the hot water rinse were important. Homemakers finally started using it too. 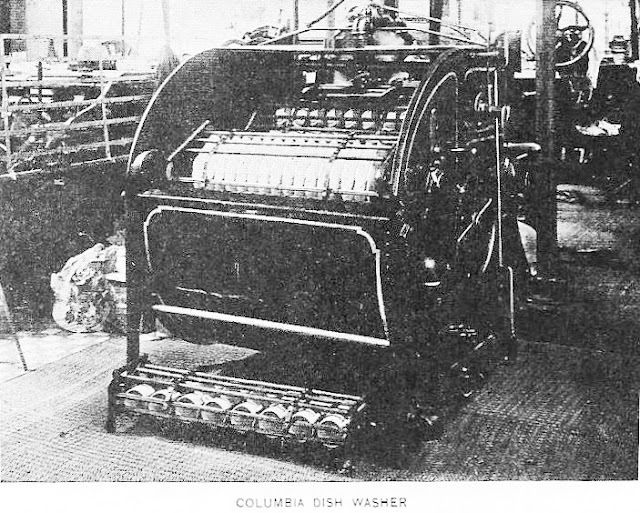 In 1912, at 73 years old, Cochran was still personally selling her machines. She managed her company until she died of a stroke in on August 3, 1913 in Chicago. She was buried in Graceland Cemetery in Shelbyville, Illinois. In 1916, her company was bought out by Hobart which became KitchenAid and is now Whirlpool Corporation. Cochrane is considered the founder. Eye-opening articles, as usual. You make learning fun.